My kids was tested positive of primary complex last April 2009. And after 6 months of drinking Primary complex HRZ kit aka Blood, Urine and Vomit they are clear of TB. See? It does look like Blood, Urine and Vomit. But my sister who loves food better than me says it’s mayonnaise, vinegar and ketchup. Primary Complex is not contagious. Don’t ever make your kids feel that what they have is something to be embarrassed about. Based on my readings and from my pedia, Primary Complex is now common here in the country. It’s not as scary as it used to be ten years ago and it can be easily cured. Primary Complex is a from of Tuberculosis on kids. They got it from an adult. When an adult suffering from Tuberculosis made contact to a kid through cough and sneeze, the mycrobacteria M. tuberculosis is transferred to the kid. Primary Complex is a 6 month long treatment. Not lesser. You need to make sure that you give the meds everyday religiously for 6 months. If not, the bacteria will just evolve and will develop into a more med resistant kind. During the first 4 months, your kids need to take in 3 types of medicines (photo above). On the 5th and 6th month based on the advise of your pedia, the meds may be lessen to two kinds. It is best to give them meds on the morning, 30 minutes before eating but you can also give it during lunch time (just make sure that you give it 30 minutes before meal time). Also take note of the time you give the meds, it should be the same time all through out the treatment period. The three meds have different consistencies. If your kids are a bit hard when it comes to medicine, you should give them the pink med first as this is the most ill tasted. This is done so that whenever the kid refused to swallow it up or throw it up, they hadn’t taken in the other meds yet. Give the yellowish next and give the red one last. The red one is the most difficult to swallow, hence they will need a lot of water to consume it. You should give it to them last because they would be full from drinking water to help them swallow the red one. Stick to the meds your doctor gave you. I tried buying the cheaper kit but it turns out that though I save on money, my kids did not like the taste of the cheaper kind. The photo above is the set from Unilab. Trust them to be child’s tongue friendly (TasteRite™ technology). If you child gains weight easily, you might wanna consult your pedia every month for the dosage as it’s effectiveness rely on the weight of the kid. How much is Primary Complex Treatment? In order for you to know if your kid is suffering from Primary Complex, they will have to undergo two kinds of test, XRAY and PPD (purified protein derivative) or tuberculin skin test. XRAY test can vary from 300 Philippine Pesos to more than 1K depending on your hospital. In some hospitals, this is shouldered by your HMO, in some it is not. PPD or Tuberculin Skin test ranges from 600 Pesos to more than 1k, again, depending on your provider and this is NOT shouldered by HMO. The HRZ Kit (Isoniazid + Rifampicin + Pyrazinamide) from Unilab was less than 500 the last time I bought, so that was last year. A kid can consume 1 to 2 (or 1 to 2 big HRZ kit) bottle a month depending on his weight. 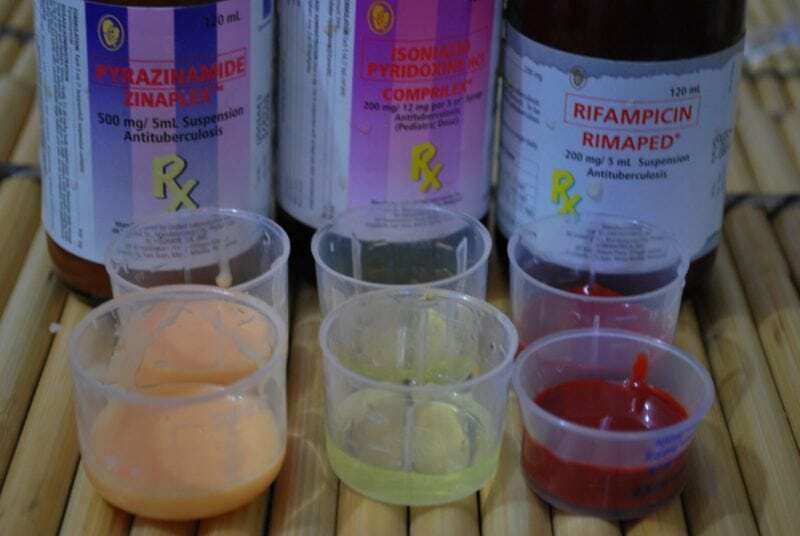 It is best to buy it in pack (HRZ kit) as you can save a lot than buying the medicine per bottle. Trust me, I have been there, spend time computing it to see where I can save more. (I will try to update this when I got the prize of each meds). Rimafed or the red one will be consumed more than the other two. Rimafed is given in more ml than the other two that is why. The total amount of Peso you will have to spend when treating Primary Complex (if you have a kid that is less than 15 kilos) is around (cost of xray and ppd not included) 5000 Pesos.